Installation of Advanced Lighting Switches and Controls in Various Building - Noreas Inc.
NOREAS has a contract with the U. S. Army Corps of Engineers (USACE) Los Angeles District to install advanced lighting controls, switches and occupancy sensors at 66 designated permanent buildings within the cantonment area of Fort Irwin National Training Center, California. 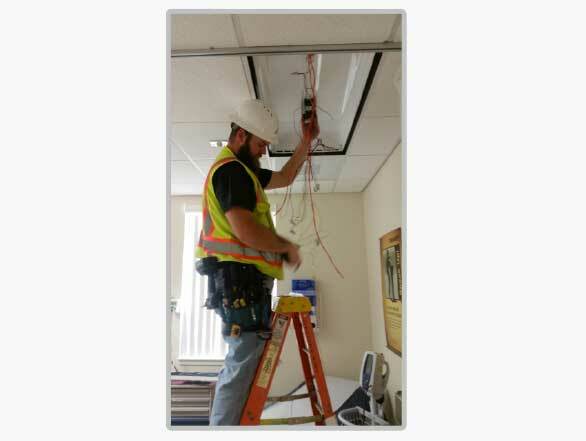 The purpose of the project is to replace the existing lighting system using advanced lighting controls and energy efficient fluorescent luminaries to reduce waste of light energy during occupied and unoccupied hours. The buildings include administrative offices, computer server rooms, dining facilities, classrooms, conference/meeting rooms, hallways, medical clinic spaces, storage areas, and barracks. The project also involves installation of light emitting diodes (LED) fixtures, dimming control systems and system programming, and installation of radio frequency (RF) devices. NOREAS utilizes one of five specific Advanced Lighting Control Energy Saving Strategies for each. These Strategies include: 1) Occupancy/Vacancy sensors for automatic shutoff of lighting when spaces are unoccupied using specific types of sensors, 2) Automatic Task Tuning (High End Lighting Trim) by dimming designated occupied areas through the adjustment of the high-end light levels of the fixture, 3) Automatic Daylight Harvesting using continuous dimming of light fixtures to maximize the contribution of daylight save energy and maintain target light levels in the space, 4) Manual (personal) control of lighting, and 5) Providing demand-response ready control of lighting.